If this is your first visit to We Choose This Life -- Welcome! Starting June 2012, a monthly blog carnival, Our Life On Wheels will be held here. Fulltime travelers will come together to share about a variety of topics. If you want to learn more about the carnival head over here. Make sure you scroll to the bottom of the post the link up or check out others "RV Must Haves". And don't forget to check out last months blog carnival, "A Day In the Life Of..."
1. Lightweight Non-Breakable Dishes: We chose BPA Free, Melamine dishware. Our Laurie Gates dishes were purchased at Costco (4 place settings for around $25). I loved the color that they brought to the table, add in the fact that they are lightweight, inexpensive and unbreakable, we have never once regretted the purchase. When the time comes that we are needing new dishes I think I will go with Zak Designs , I am particularly fond of their Confetti Recycled Melamine line. 2. Magnetic Spice Tray & Magnetic Knife Rack: Besides my Vita-Mix, these two magnetic kitchen items are a MUST HAVE. For the magnetic spice tray, I purchased a metal tray from a antique store (also can be found on Ebay) and then magnetic spice tins from Bed Bath and Beyond (you can get them at World Market also). The magnetic knife rack was purchased at Ikea. Just an FYI the spice tins nor the knives are removed for travel, also both the spice tray and the knife rack were installed with regular screws and a drill (or screwdriver, can't remember which). 4. 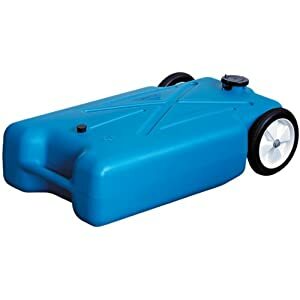 Portable RV Waste Tank: If you plan on staying places that don't have full-hookups (which include many Thousand Trails, state & county parks) and plan to be using a dump station, you have got to get one of these. When your tanks are full, you no longer have to hookup your trailer and pull it around to the nearest dump station. Just fill up your 22 Gal. Original Tote-Along , hook it up to your hitch and drive the portable waste tank to the nearest dump station. You could also have your 8 & 10 year old try to tote it over, that makes for quite the entertainment. When not in use our rides on our back ladder attached with some strappy tie downs (technical I know). 5. RV Stabilizer and Leveler Blocks: Long gone are the HEAVY chunks of wood we use to haul around. 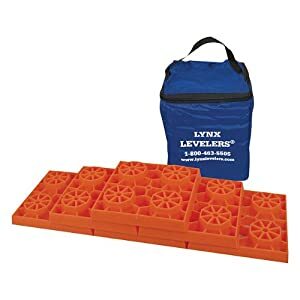 For about 18 months we've had the Lynx Leveler Blocks . We use them to under our tongue and stabilizer jacks and to level the trailer side to side. We have two sets of 10, they are lightweight, easy to store and very useful! Our Life On Wheels :: Blog Carnival :: "Meals on the Road". August 2012 :: "Meals on the Road" How do you cook in that tiny RV kitchen and fit your food in that tiny RV fridge? What are your favorite on the road meals? How often do you grocery shop? Do you have a favorite recipe or kitchen item you couldn't live without? We want to know about it! --Please have your post ready to link up by Monday, August 6. Check out the guidelines for Our Life On Wheels :: Blog Carnival if this will be your first time participating or if you have any questions. Thanks for sharing. Those dishes really are cute! hi, your 5 must haves are a great suggestion! Hi Tereza, Here is a brief post about our home on wheels, http://www.wechoosethislife.com/2012/04/introducingour-new-home-on-wheels.html We've only been in the new one for just over 2 months, so we're still working on getting it all redecorated. It is a 2013 Sabre 32QBTS. You can see our old home on wheels, if you click the link at the top "Our RV", it was a 2003 Keystone Sprinter 303BHS. What fun dishes! The magnetics are a great idea. Hi Stacey, Thanks for stopping by. One step at a time and you'll get it all done. More than likely you'll keep too much stuff and purge more once you're in your RV. Let me know when you find your new home and start a blog!! GREAT must haves!! I wish the linky would have stayed open longer... I was busy last week :) Oh well, next month!! Stephanie, love your blog! And we are just starting our traveling journey with 7 kids in a 24 foot trailer. Your list is right on and we have already said we need to put the last two items on our wish list. We have the Zak recycled plates and I loved them; however, they are not very durable. We were down to 1 bowl, three salad plates, and six dinner plates because sometimes when they get dropped they shatter - I think it is the bonding of the recycled bits. I have your blog posted on mine, hope you don't mind - www.7ramblingkids.com. Keep blogging these great ideas! This is the first time I have seen your blog and love it. We raised three boys. Yours sound like 100% boys. LOL All seem very well loved and behaved. Hmmmmm? Perhaps LOVED = BEHAVED. I will enjoy following your blog. My wife and I are full-time going into our second year and miss our grandchildren and children but are loving our new life. Nice list of rv must haves. I've been searching all over the place for the best items i should get when I buy my new rv soon. www.rvmusthaves.com has a lot of cool stuff you can add to your list. Plus, there are some great rv groups on facebook with good advice. Thanks for the tips! Also, looks like you haven't updated your blog in awhile. Are you still living the dream?